The mention of cakes brings back fond childhood memories…I remember that the only thing B’days meant for me was cakes and gifts; cake cutting was THE most anticipated moment that evening. I vividly remember how I, along with the other kids used to ghetto around the cake and gazed greedily …and oh what a moment it was to lick the cream with the small finger when no one was looking!! Having grown up, I realise my fascination for cakes has remained unchanged. However, I always thought that baking cakes was a REALLY BIG DEAL, and so never attempted baking one, till I got married; then I buckled under the Amit’s emotional blackmail ……I am so glad I fell into the trap. The first time, I tried baking one; Amit and I were sooo kicked up; we went shopping for all the ingredients, surfed a zillion recipes and finally when the cake mix was in the hot oven, we stood endlessly gazing with the same childhood twinkle in the eyes. I really don’t remember how it turned out, but certainly remember that build up to it was exciting. For a first time, it wasn’t that bad at all. The pleasure of eating a home baked cake is unparalleled; the fact that, this cake that I baked at dinnertime was half finished before midnight, proves the point. 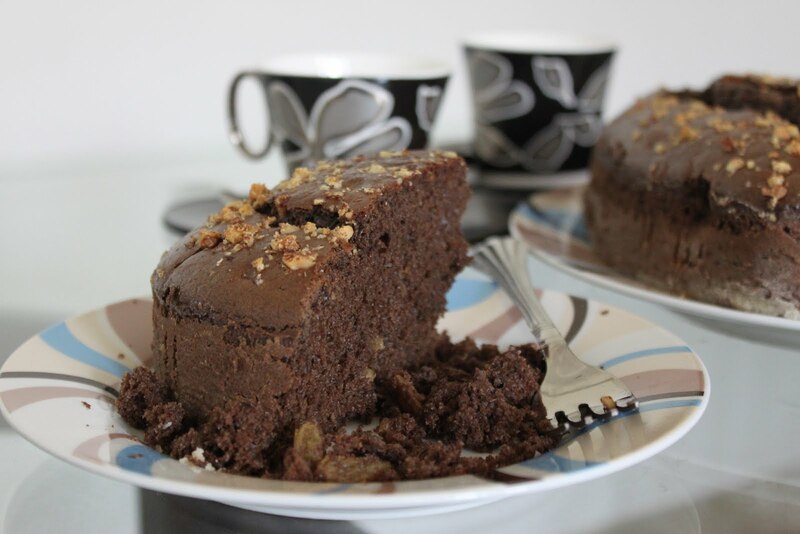 Over last three years, I have perfected some recipes and introduced some variations, to make the cakes spongier and yummier. I will share several of these recipes in days to come, so do try baking, because it’s simple and everyone can do it, I promise! This one’s especially for you Aditi!! Mix everything together until smooth; either by hand or by using an electric mixer at slow speed (for about 2-3 minutes), I prefer using the mixer, because it saves all the hard work! Previous Post Confluence of Awadh and Mewar!! Hey Ishita, this is absolutely stunning. We have been waiting for this magic recipe ever since we tasted it. Very nicely explained. I would love to try it out. (Imagine a kichen-moron like me!). Vikas, I am sure it'll turn out better than my preparation….just follow the steps…and yes thanks for the encouraging words!! I really like this one that you make…its yummy!! Thanks Dhivya, I have no plans for sticking to only health food…will be putting lots of other interesting stuff, like soon to follow are a chocolate and carrot cake, I know grating carrots can be quite painful, why don't you use ur food processor for that? And if u want to make it real quick, use only half the quantity for a start!! Good luck, do let me know how it turned out!! Ishita I think my husband loves me even more!! Tried this last evening and it turned out yummilicious… Anubrata insists on me tryin all the recipes u put up… so next is definitely the salad… Love u sweetheart!! This is so tempting, so unlike health foods. Thanks for reminding us of hidden treasures. Thanks Aditi…I hope I am able to keep up to the expectations!! YummmY! The one you bake is toooo good…I turn into a toddler begging every hour for another piece! Hope I lose weight soon and can have loads of it…publish your carrot and pineapple cake recipe too..viewers will love that too! This salad is really great….. It is now a regular part of My weight losing prograamme….. THANKS A Lot. wow that's nice…i'll try and put some more interesting health recipes! !